For he heard her voice: O strange wonder! Saint Neophytos of Vatopaidi was a church caretaker or sacristan (prosmonarios) at the Vatopaidi Monastery of Mount Athos in the 17th century. He was sent to the monastery's metochion (dependency) which honored Saint Athanasius in Evia to serve. 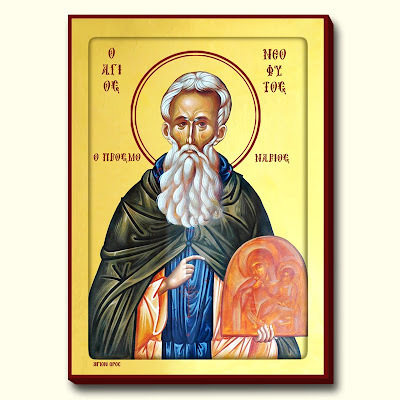 After two years Neophytos fell grievously ill, and he turned with intense prayer to the Most Holy Theotokos, asking to be allowed to die in his own monastery. 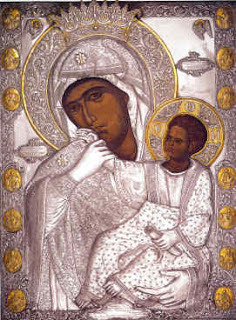 He heard a voice from the Paramythia icon of the Mother of God, which was a copy of the original from Vatopaidi, saying, "Go to your monastery, Neophytos. You will be ready in a year." The miraculously healed Neophytos returned and intensified his spiritual efforts in preparation for his departure from this life. After a year of repentance, when he had received the Holy Mysteries of Christ, he again heard the voice from the original Paramythia icon of the Mother of God saying that it was time for him to depart. He returned to his cell and fell ill. After asking forgiveness from the brethren, he surrendered his soul to the Lord.